Baskin-Robbins, California aún no tiene suficientes puntuaciones de la comida, el servicio, la relación calidad/precio o la atmósfera. ¡Sé de los primeros en escribir una opinión! You're invited to a Jubilee. Other guests include cherry flavored ice cream, cherry halves, & a hint of rum flavor. Ovens drool. Freezers rule! So we loaded vanilla flavored ice cream w/ cookie dough & chocolate flavored chips. It's the eternal debate: vanilla or chocolate. But this vanilla flavored ice cream loaded w/ semi-sweet chocolate chips lets you stay happily undecided. If you put your ear up to this summery lime ice w/ a splash of rum flavoring, you can hear the ocean. Go for the Gold w/ this combo of vanilla flavored & chocolate ice creams swirled w/ a caramel ribbon. Take our Jamoca ice cream, add roasted almonds & a chocolate flavored ribbon. Feel your taste buds buzz. Made w/ our exclusive blend of coffee ó you may want a scoop of Jamoca first thing in the morning. Buttery, caramelly ice cream w/ Snickers, swirled w/ a caramel ribbon. Why are you not eating yet? Ready​ for a scary good creation? Vanilla flavored ice cream packed w/ orange creme filled OREO cookies, Baby Ruth & Butterfinger candy pieces. It's terrifyingly delicious. Strawberry. Candy. Cake flavor. Confetti-topped cake pieces. Blue whipped cream. It's somebody's birthday today. Let's celebrate! Here's the pitch: vanilla flavored ice cream & cashews w/ a black raspberry ribbon. You'll charge the mound every time. Walnut flavored ice cream w/ a black walnut explosion. An armored tank couldn't stop this mouth-watering walnut attack. A​ little bit blue, a lotta bit delicious. Creamy cheesecake flavored ice cream packed w/ cheesecake bits & swirled around w/ a blueberry ribbon. We haven't gone nuts. But our chocolate ice cream loaded w/ roasted almonds? Well, that's another matter. Take everything you love about chocolate & multiply it by chocolate. It's chocolate & then some. A creamier & dreamier version of your favorite fluffy, puffy treat. Swirled in pink & purple, for extra cuteness. This creamy, rich cream cheese flavored ice cream is velvety goodness w/ a Cajun flair. In other words, it's a 'Big Easy' treat. Even Ol' Scrooge can't resist this rich, thick, & oh-so-tempting egg nog flavored ice cream. Our cake cone is a scrumptious way to enjoy our famous Baskin-Robbins flavors. Enjoy your favorite Baskin-Robbins flavors in our delicious sugar cone. Our freshly baked waffle cones are a perfectly delicious pairing w/ our tasty ice cream flavors. This classic ice cream treat starts w/ two of your favorite ice cream flavors topped off w/ bananas, hot fudge, chopped almonds, whipped cream & a cherry. Nutritional information for this product will vary based on the ice cream & toppings requested. Three scoops of Chocolate Chip Cookie Dough ice cream w/ layers of hot fudge & cookie dough pieces, topped w/ caramel & whipped cream. Yum! Delight in a traditional treat w/ three of your favorite ice cream flavors, two banana slices, your choice of toppings (choose from marshmallow, strawberry, pineapple & chocolate syrup) all crowned w/ chopped almonds, whipped cream & three cherries. Nutritional information for this product will vary based on the ice cream & toppings requested. A rich combination of coffee from 100% Arabica coffee beans & our smooth & creamy Vanilla Soft Serve, blended w/ ice & topped w/ cinnamon. The ultimate pick-me-up any time of day. Give in to your caramel desires w/ real coffee blended w/ Vanilla ice cream & caramel syrup, then topped w/ whipped cream & caramel praline topping. Completely joyous! Enjoy a burst of energy w/ the sweet flavor of our Mocha Cappuccino Blast served over ice. It's the perfect pick-me-up or treat when you're on the go! Enjoy​ a burst of energy w/ the sweet flavor of our Cappuccino Blast served over ice. 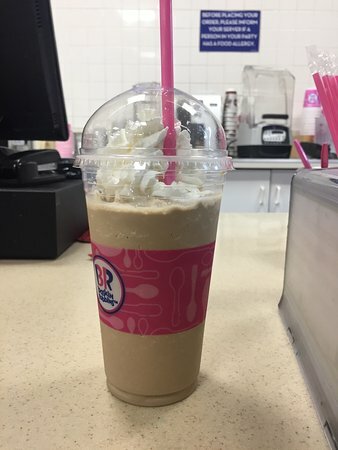 It's the perfect pick-me-up or treat when you're on the go! A favorite for every OREO lover! OREO Cookies ën Cream ice cream blended w/ coffee made from 100% Arabica beans & crushed OREO pieces. A rich combination of coffee from 100% Arabica coffee beans & vanilla ice cream blended w/ ice & topped w/ whipped cream & cinnamon. The ultimate pick-me-up any time of day. Total​ indulgence is yours to enjoy! Delight in real coffee blended w/ Pralineís ën Cream ice cream & caramel syrup, topped off w/ whipped cream. Enjoy a taste of the tropics w/ yummy mangoes blended w/ ice for a refreshing trip to paradise. Sweet Strawberry is combined w/ tangy citrus & ice for perfect refreshment. The tropical taste of guava, orange & passion fruit blended w/ ice. A refreshing exotic escape. Smooth​ & creamy Soft Serve w/ M&M's & hot fudge. Smooth & creamy Soft Serve w/ chopped Snickers & caramel praline topping. Smooth​ & creamy Soft Serve w/ crushed OREO cookies & hot fudge make for a delicious indulgence. Treat yourself to chopped Reese's Peanut Butter Cups & Reese's Peanut Butter sauce w/ our smooth & creamy Soft Serve. Enjoy smooth & creamy Soft Serve w/ chopped almonds & strawberry topping. This delicious indulgence is a crispy, crunchy, smooth & creamy treat w/ Vanilla soft serve mixed w/ Butterfinger pieces. Treat yourself! Delight in Chocolate Chip Cookie Dough pieces w/ smooth & creamy Vanilla Soft Serve. Heath bar & Vanilla Soft Serve is a treat that is sure to delight any sweet tooth. Bring on the cheers w/ delicious M&M's mixed w/ Baskin-Robbins smooth & creamy Vanilla Soft Serve. It's sure to make you say "Yay!" Deliciousness! Take our crushed Snickers pieces w/ Baskin-Robbins smooth & creamy Vanilla Soft Serve for a swirl. Smooth & creamy Vanilla Soft Serve blends w/ crushed OREO cookies in this delicious indulgence. Smooth​ & creamy Vanilla Soft Serve blends w/ Reese's Peanut Butter Cups to create this candy-lover's dream. Necesitaba que después de la cena se arreglaran helados! Están muy cerca de Cannery Row. Está a poca distancia de la mayoría de los hoteles allí. Gran helado como de costumbre! Llegamos justo, ya que estaban a punto de cerrar, el personal era servicial y nos sirve. Los helados eran como esperaba, muy bueno. Visité aquí dos veces, una vez durante el día y una vez en la noche. Durante cada servicio de visita fue muy buena y amable. Muy deliciosa. mocha blast La zona era algo pequeño y no un montón de espacio. Este Baskin-Robbins estaba en una buena zona y a poca distancia a pie. Una parada fácil y confiable en el camino a 17 km en coche. La ubicación es en la calle principal del centro de Monterrey para Cannery Row. Cada vez que he estado allí, el servicio ha sido rápido, incluso si era una época. Lo que no le encanta sobre helado? Después de una maravillosa cena de pescado en el Mercado de Pescado de mar cosecha terminamos una maravillosa comida con una taza de delicioso helado. B-R es siempre coherente y fiable. Como siempre, BR justo en el clavo! Fuimos con nuestro hijo ... no habíamos estado nunca en un dormitorio en un cierto tiempo. He probado unos cuantos nuevos sabores, pero aún así nos recogió favoritos! El personal era amable y servicial. Apreciamos que le dan un descuento militar!!! ¡Muchas gracias! Estábamos deseando un helado una noche y Baskin-Robbins vinieron a través para nosotros. Estaba justo a la vuelta de la esquina del hotel y el servicio era rápido. El precio era muy fácil a swallow , junto con las cerezas que me dieron!! 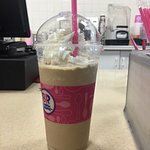 Recibe respuestas rápidas del personal del Baskin-Robbins y de clientes anteriores.